Take your expertise to the next level—whether your focus is K-12 or higher education—and open the door of opportunity for leadership in education. Our Ed.D. will prepare you for public and private academic environments so that you can apply your research in whichever setting complements your passions. The Doctor of Education in Learning Organizations and Strategic Change is focused on educational leadership, theory, practice, collaboration, research, global perspectives on learning, innovation, organizational change and ethics as part of Christian faith. Watch the information session webinar for the Doctor of Education program. We know that you want to start making a difference now. That’s why our program culminates with practical, collaborative doctoral research that addresses real needs in authentic settings for the purpose of informing educational practice. We offer the same rigorous program in two delivery formats: on-campus and online. Study in a program that includes a focus on the intersection of faith and professional practice—from wherever you are. In your doctoral studies, you will engage with the specific knowledge, understanding, exploration and investigation described by the framework. You will also examine the attitudes, values and dispositions that can assist you in becoming an effective leader within educational organizations. The program framework promotes consideration of global perspectives about culture and diversity that are important to effectiveness and success in educational leadership. Explore contemporary research, practice appropriate research methods and gain experience working as research team on educational research for a real learning organization. Question and debate the wisdom of varied educational leadership practices as well as emerging educational policies and practices. Consider methods for leading strategic change within learning organizations. The program framework will help you develop and organize your thoughts, values and convictions about the elements, craft, and practice of effective educational leadership. The Doctor of Education in Learning Organizations and Strategic Change is focused on preparing educational leaders for public and private organizations and academic settings. The Ed.D. program began in fall 2010 with a single cohort of 22 students meeting on campus. Each subsequent year the program seated two additional cohorts. There are now over 70 doctoral students enrolled in the on-campus Ed.D. program at any given time. Students in the on-campus program are experiencing tremendous success academically. Over 90 percent of the students who have started the program have graduated or are continuing to progress toward graduation. The on-campus cohorts participate in class sessions on the main Lipscomb University campus in Nashville, Tennessee. The program culminates with practical, collaborative research that is designed to address real questions in authentic settings for the purpose of informing educational practice. Lipscomb University offers online delivery of the same rigorous and respected doctoral program that is offered as an on-campus program. The 3-year online with intensives delivery model is designed to broaden the influence and benefit of the program beyond the Middle Tennessee region. 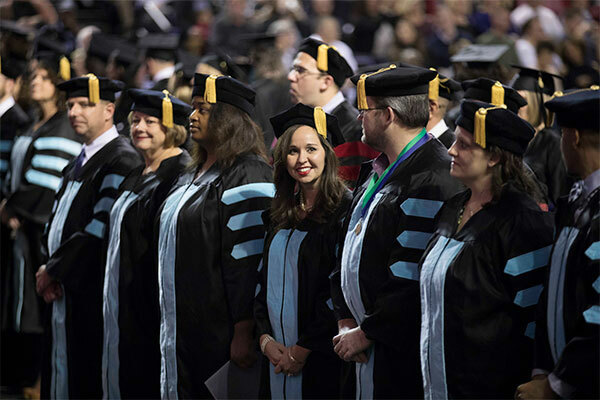 Using high-tech platforms, the doctoral program connects candidates with high-quality faculty and promotes collaboration between peers within each cohort. You can earn your Ed.D. from a university that encourages the examination of how faith and Christian values intersect with professional practice. All online Ed.D. courses are semester length. The online program of study includes three on-campus ‘intensives’ which are held Thursday through Saturday at specific times during the 3-year program. A fourth intensive involves a 10-day international experience during the summer semester at the end of the first year of the program. Capstone research culminates with a required on-campus defense of the capstone research results. Read the Online Cohort Frequently Asked Questions. In an increasingly diverse educational landscape, we believe in the importance of examining educational leadership with a global perspective. That's why the program offers a 10-day international experience in Europe during which you will meet and interview educational leaders, policy makers and practitioners. You will study and consider educational policy reform initiatives at the primary, secondary and post-secondary levels. You will be challenged to consider educational systems and institutions as they relate to their national, international and global context as well as their political, economic and cultural context. The trip highlights educational challenges and initiatives that are taking place around the globe and encourages you to consider how others are approaching the educational challenges that they face. The Doctor of Education program culminates with practical, collaborative capstone research that addresses real questions in authentic settings for the purpose of informing educational practice. Capstone research involves collaboration between members of the research team, the research coordinator, Ed.D. faculty, the doctoral committee, the university IRB, and the client educational organization for which the research is being conducted. Lipscomb University has accepted research proposals from over 60 educational organizations that have been or are currently being served by students through their doctoral research. This represents critical engagement between the Doctor of Education program, its students and the education community. The capstone research teams are comprised of 2 to 3 students. During the program, students will be asked about their research interests by the Doctor Research Coordinator. That information will be used while recruiting and reviewing proposals from potential client organizations. Capstone research culminates with an on-campus defense of the capstone research results. Intensives: In addition to the online work, the cohort will meet together on campus for "intensives" during the program as shown above. There will be three Thursday—Saturday intensives during the program that involve the entire cohort meeting in all-day sessions with Ed.D. faculty. Additionally, there is a fourth intensive which involves a 10-day international experience during the summer semester at the end of the first year of the program. $763 with in-service scholarship. Lipscomb offers a 20% ‘in-service scholarship’ to all full-time educators (K-12 or higher education). As you give back to the community, Lipscomb University wants to give back to you. The College of Education offers significant scholarships to current educators and administrators. Check out the following information to see if you qualify for scholarships. Learning alongside educators from both the K-12 and higher education arena will afford you opportunities to form relationships with leaders in the education community and establish connections that will serve you throughout your career. Educational leadership positions in K-12 include instructional coaches, lead faculty, assistant principals, building principals, executive principals, a variety of district roles including superintendents, and a variety of roles in the state department of education. Educators work in higher education as faculty or in administrative roles such as program directors, deans, vice presidents, and presidents. Their job duties vary depending upon the role they fill. Education support organizations provide services to both K-12 and higher education. These organizations include a number of leadership opportunities in the area of policy formation, advocacy, professional development, assessment services, and support for educational leaders and institutions.